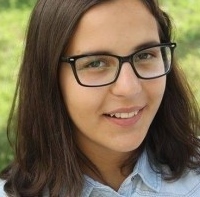 The 14-year-old Romanian writer, Irina Novac, recently published her first book, “A Moment as an Eternity.” About love, crime, and drama, her novel takes place in the U.S. for the first half and Romania for the latter. The story centers on two high-school sweethearts, Angela and Chuck. At their prom, Chuck proposes to Angela and she accepts. The moment of romance quickly devolves into tragedy, however, when Angela is murdered by her jealous best friend, Demi. Bereaved by Angela’s death, Chuck stages a setup for Demi until she finally confesses and is imprisoned. To excite readers about the coming sequel, Irina ends the story as a mystery. Her editor, the first person to read her book in digital format, and her school headmaster, the first person to read a the physical copy, both believe that her book can become a bestseller. Like any aspiring writer, Irina has similar dreams of success. During her free time, Irina likes to act, and play handball and football; her football team is the national champion. Irina also enjoys writing screenplays and would like to direct her own short films. Although she is very busy with those activities, Irina would also like to become involved in more volunteer activities. In the future, Irina would like to attend the Film Academy in New York City.